Our teaching services offer practical (yet fun) ways to understand horses and our relationship with them. We don’t give traditional riding lessons. Instead, Horse Wise teaches you how to observe and understand equine behavior, personality and biomechanics. Whether a horse novice or a seasoned rider, Horse Wise can help you “see” horses from a new perspective. Our workshop series is geared toward people who want a basic introduction to horses and how to handle them in a natural setting. 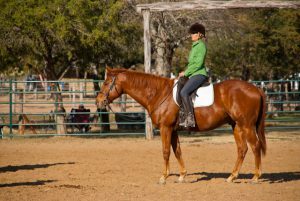 The format is friendly and relaxed, with one-on-one support from the teacher (and the horses). Our mini-clinics and coaching sessions are designed for experienced equestrians seeking a fresh viewpoint on their riding partnership with their horses. Customized biomechanics exercises will spotlight the patterns of your horse-rider team (and create new approaches to schooling sessions). Contact us for more information. In the words of the great Ray Hunt, “The horse will teach you if you will listen.” Horse Wise creates an environment in which you can learn from the horse in supportive, practical ways.